Trek from the South to the North of Andros on the Andros Route, a recently restored historic trail. Let old, walled mule tracks lead you through terraced fields from one picturesque village to the next on this self-guided walking holiday. On arrival at Athens airport an included taxi will take you to the port of Rafina, from where you take the ferry Andros. The ferry crossing is approximately 2 hours. On arrival in the port of Gavrio you travel by local bus (1hr) to Ormos Korthiou. Once at your hotel you will receive a welcome pack that includes a small pruner and gloves, in order to contribute to activities of the voluntary organization 'Andros Routes' and help (if you wish!) keep the trails trim. Your first walk of the holiday starts at the Tromarchion Monastery perched high on a cliff on the west coast of Andros. Your walk starts along walled paths that provide some shade. Pass through sleepy hamlets and enjoy panoramic views on the wide valley of Korthi and, the more you continue eastwards, the sea at the far horizon. A short section is on a dirt road, but most of the walk is on old footpaths that were once the only connection between the villages. Walk to the beautiful town and bay of Ormos Korthiou where you spend the night. Today's 8km walk is expected to take approximately 3 hours and you will ascend 130m and descend 260m. Todays' walk follows a great route through the semi-deserted inland of Andros. Outstanding views, tiny, well-hidden villages, old watermills and beautiful stony trails are what you encounter today. The first part of the route leads you through traditionally cultivated land, which has been made suitable for small-scale farming centuries ago. Then cross the mountain ridge which leads you to the valley of Andros Chora. From here there are impressive views over this great valley and the town of Andros Chora with its traditional white buildings. Walk through forest and orchards until you reach the town and then continue to the beach of Nimborio where you spend the next two nights. Today's 14km walk is expected to take approximately 5 hours and you will ascend 530m and descend 530m. You may decide to explore Andros Chora before heading off on your walk today. The town has two museums, stone walkways and a combination of Venetian, Byzantine and Ottoman architecture not to mention plenty of local cafés and pastry shops. We suggest a 9km walk along wide paved paths and through forest to Apikia, a village situated in a green valley famous for its spring water. You descend along cypress hedges to the old Bitsis-tower house and further to the sandy beach of Gialia. There is a short, demanding climb before you descend to the beach of Nimborio. 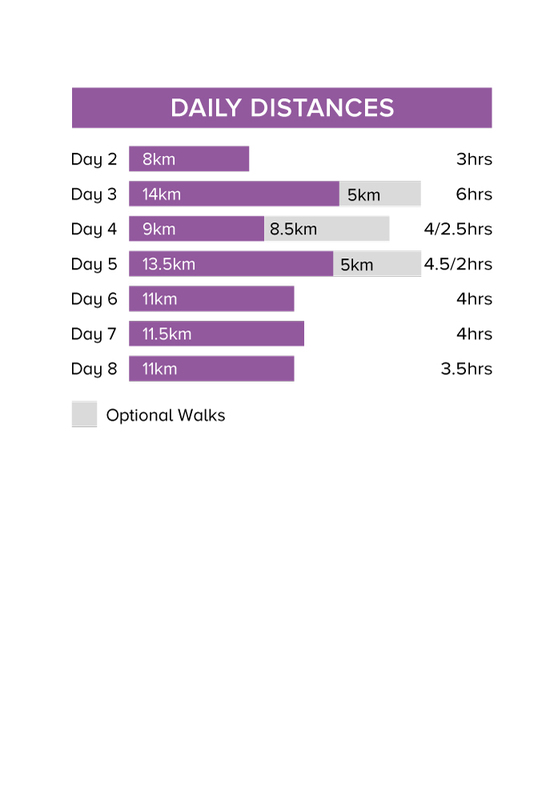 If you want more of a challenge there is a longer walking route available of 17.5km. Today's 9km walk is expected to take approximately 4 hours and you will ascend 400m and descend 400m. If you decide to take the longer route of 17.5km it is expected to take 6.5hrs and you will ascend 600m and descend 600m. Today you take a local bus to Messaria and head for the west coast of Andros. From here you walk to the exceptionally beautiful, verdant village of Menites with its famous Lion head adorned springs. In the village square you will find many water fountains, considered therapeutic in ancient times. Refreshed you start your demanding climb on Petalo Mountain, follow the old trading route over its slopes with great views over green valleys, villages and the sea far below. On your way uphill you pass through the village of Ano Pitrofos. (If you take a taxi to this village, you avoid half of the ascent, 300m, and shorten the walk by 5km.). Lastly you descend to the charming seaside town of Batsi, and your hotel for the next two nights near the fine, sandy beach. Today's 18.5km walk is expected to take approximately 6.5 hours and you will ascend 560m and descend 700m. There is an alternative walk of 16km available. Start by taking a taxi to the nearby village Remata from where you walk via a shaded, lush, stream bed ascending to the green villages of Arni and Katakilos. Follow a wide valley with terraced fields to the hills above Batsi. You finally descend to the village enjoying great views of Batsi and the sea. Today's 11km walk is expected to take approximately 4 hours and you will ascend 400m and descend 600m. High above the coastline your walk today offers wide reaching views of the Aegean Sea. You can stop to visit the largest Monastery on the island. The fortress-like Zoodochou Pigis Monastery is considered one of the most important in Andros, and has a library rich with books, manuscripts and old heirlooms. The walk ends at the beautiful seaside village of Agios Petros. This sleepy fishing village is on the quieter Western side of Andros and has a long sand beach where you can take a swim in the shallow waters or just sit down and soak up some more of the soothing Greek sun. If the accommodation is full in Agios Petros you will stay in nearby Gavrio. Today's 11.5km walk is expected to take approximately 4 hours and you will ascend 450m and descend 450m. 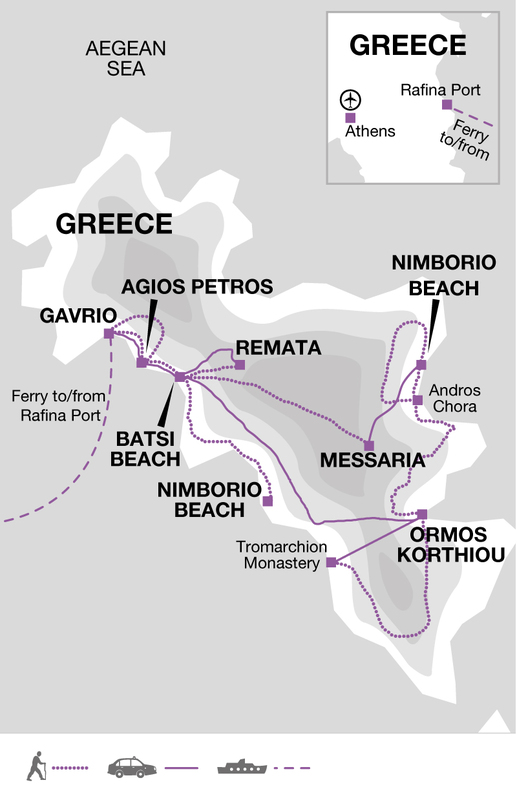 Today is your last day of walking the Andros Route and you head to the port of Gavrio and surrounding countryside. You walk below the village Ano Gavrio and ascend via a pleasant, but steep, path to the summit of a hill. There are great views from the top. Then you descend into the valley of Agios Petros and walk past the imposing Hellenistic Tower back to the beach. Today's 12km walk is expected to take approximately 3.5 hours and you will ascend 400m and descend 400m. After breakfast the organised part of your holiday comes to an end. Day 2 there is a taxi to the start of the walk that needs to be paid locally. The cost is approximately 16 euro per taxi. Athens airport is served by low cost carriers (including Easyjet) and charter / schedule airlines (including Thomas Cook Airlines, British Airways) from various UK airports including London Gatwick and Manchester. Fly to Athens. Please note that you need to arrive to Athens airport by 14.30 in order to catch the ferry to Andros or you will need to book an additional night in Rafina. Your transfer from the airport to the port is included, and your driver will also provide you with your ferry ticket. For your departure you will need to take the ferry back to Rafina. A ticket can be pre booked for you if you request it at time of booking this holiday (not included). On this journey you walk 78km over 7 days (an average of 11km a day). Walking routes are generally 3 to 6.5 hours with a maximum ascent of 540m on one day. Moderate day walks are interspersed with more strenuous sections in hilly to mountainous areas using well-kept, sometimes stony paths. We have graded this trip as moderate. Mon 1 Apr 2019 - Fri 24 May 2019 Your trip can depart anytime between the above dates. Contact us for triple room requests and solo traveller prices. Sat 25 May 2019 - Mon 24 Jun 2019 Your trip can depart anytime between the above dates. Contact us for triple room requests and solo traveller prices. Tue 16 Jul 2019 - Thu 15 Aug 2019 Your trip can depart anytime between the above dates. Contact us for triple room requests and solo traveller prices. Fri 16 Aug 2019 - Sat 31 Aug 2019 Your trip can depart anytime between the above dates. Contact us for triple room requests and solo traveller prices. Wed 1 Apr 2020 - Sat 30 May 2020 Your trip can depart anytime between the above dates. Contact us for triple room requests and solo traveller prices. Sun 31 May 2020 - Mon 29 Jun 2020 Your trip can depart anytime between the above dates. Contact us for triple room requests and solo traveller prices. Tue 30 Jun 2020 - Tue 7 Jul 2020 Your trip can depart anytime between the above dates. Contact us for triple room requests and solo traveller prices. Wed 15 Jul 2020 - Mon 24 Aug 2020 Your trip can depart anytime between the above dates. Contact us for triple room requests and solo traveller prices. Tue 1 Sep 2020 - Thu 22 Oct 2020 Your trip can depart anytime between the above dates. Contact us for triple room requests and solo traveller prices. Fri 23 Oct 2020 - Sat 24 Oct 2020 Your trip can depart anytime between the above dates. Contact us for triple room requests and solo traveller prices.